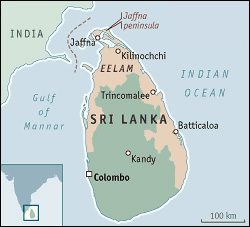 Tamil Eelam is a de facto state in Indian Ocean. It is located below the Tamil Nadu state of India and in the North East of Sri Lanka. The state of Tamil Eelam has been established by the people living there under the right of self determination given by International Covenant of Civil and Political Rights , Article 1, to which Sri Lanka is a signatory. Tamil Eelam is the home land of highly religious Hindu, Christian and Islamic Tamil speaking people. Tamils of Tamil Eelam are from the ancient times, known for their trade and commerce. Tamil Eelam will be a democratic country once it become independent. The Tamils can be defined as people, having Tamil as their mother tongue. Tamil language is a member of the Dravidian/ South Indian family of languages. Letter from a Tamil civilian to Navaneetham Pillai,Human Rights High Commissioner of the United Nations. At Manal Aru ( Weli Oya ) Who In Fact Ethnically Cleansed Whom?